Congrats on finishing that very intense revision process!!! Love the soundtrack and I totally appreciate the Neil Young bookends for the first and last chapter. And basically just SQUEEEEEEE! cannot wait to have this book in my greedy little hands!!!! Just finished my Wii workout and collapsed in chair at the computer & was rewarded with this post! I even managed enough energy to click my way over to amazon and pre-order the book. It sounds amazing - different tone than the last two and like it may be progressing the characters and storyline a bit. Thanks for the playlist and the sneak peek!!! Woot! Thanks for the update on the book, I'll get to treat myself to an early b-day present! First time I saw one of those image's from Amazon, I thought it was the actual cover. But yesh! 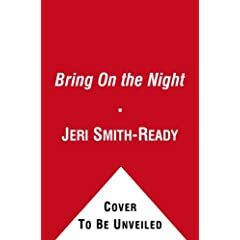 I can't wait to read Bring on the Night. Stephanie: I know you know how intensive rewriting can be! I can't WAIT to see what you think of this on. Karen: Thanks for preordering! Yeah, things definitely progress a lot, especially considering the whole book takes place in two weeks. And go you on the Wii! I love ours so very much. scape-graces: I can't wait either. I'm nervous already! Yay! More WVMP!! Can't wait! wow congrats Jeri! Job well done, as always! ;) Thanks for the sneak peek & the playlist.. Can't wait till August! Really looking forward to this, Jeri.